NEW YORK (CNS) — More than a few parents have, no doubt, had occasion to be alarmed at how easily –- and how often — kids become absorbed by gadgetry these days. Perhaps they can take comfort in the fact that such preoccupation is nothing compared to what transpires in “Jumanji: Welcome to the Jungle” (Columbia). This amusing comic adventure finds a quartet of teens magically transported into an old video game where they inhabit the avatars they chose before the start of play. Most of the laughs come from the contrast between the characters’ real-life personas and the bodies and personalities they take on within their new environment. Thus nervous nerd Spencer (Alex Wolff) becomes muscle-bound he-man archaeologist Dr. Smolder Bravestone (Dwayne Johnson). As the group faces and overcomes a series of challenges in their quest to win the game — the only means of re-emerging from it — they learn familiar Hollywood lessons about the value of teamwork and the courage required to pursue cherished dreams. The various transformations the cast undergoes recall, at times, those of Dorothy’s companions along the Yellow Brick Road. At other points, the personal conversions and belated camaraderie experienced by the adolescent denizens of John Hughes’ “The Breakfast Club” seem to be summoned up from way back when (1985, to be precise). All this might be fine for the initial ensemble’s peers in the audience. 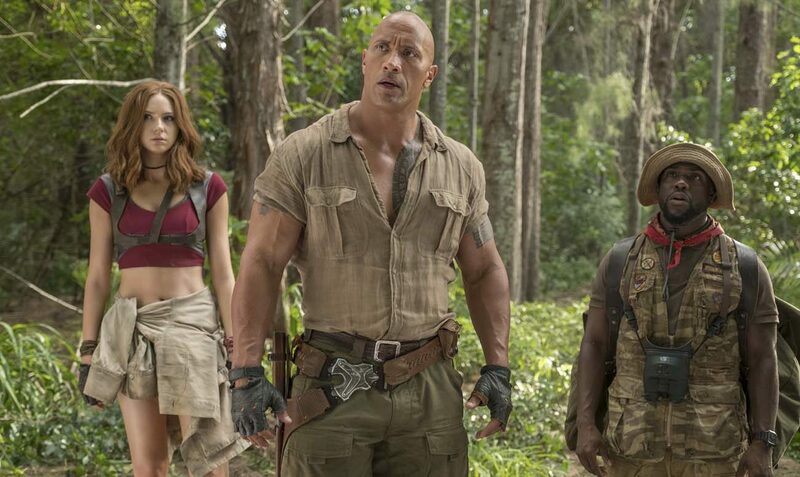 Especially since, in crafting a film that is more a variant on than a sequel to 1995’s “Jumanji” — though it’s based, like its predecessor, on Chris Van Allsburg’s 1981 children’s book — director Jake Kasdan keeps his picture’s conflicts almost completely bloodless. In the end, however, some off-color gags and a considerable amount of vulgarity in the dialogue render this strictly grownup fare. Much is made, for instance, of Bethany’s fascination with a certain addition to her inventory of body parts while her flirtatious romance with Alex (Nick Jonas), a longtime captive in the game the newcomers run across, plays on the gay subtext of her male avatar falling for the lad. Similarly, set-pieces showcasing Ruby’s fighting skills, while theoretically empowering, are in reality merely exploitative. Still, for mature viewers there is fun to be had from this trek through the jungle. But its undergrowth is too thick for the tread of kids. The film contains gunplay and other combat violence, some of it harsh but with minimal gore, at least one use of profanity and a couple of milder oaths, sexual and anatomical humor, a single rough term as well as a few crude and numerous crass words. The Catholic News Service classification is A-III — adults. The Motion Picture Association of America rating is PG-13 — parents strongly cautioned. Some material may be inappropriate for children under 13.